Are you ready to dive into the deep end of VW wackiness? Today's Nice Price or Crack Pipe 1999 VW Polo Wagon SDI will make you a god among VW Vortexans, but will its price also make you the lord of poverty? Speaking of dollars, have you ever taken a good hard look at the picture of Washington on the American one-dollar bill? They say that his tight-lipped smile is due to having painful wooden teeth, but I know a fart denial smile when I see one. It would take almost thirty five thousand of those smirking Washingtons to buy yesterday's if it's not baroque, don't fix it 1960 Lincoln Continental MK V Convertible and a patriotic 80% of you thought that was an excellent Presidents' Day sale. For $34,995, Would This Lincoln Make A President’s Day? If that Lincoln represented America at its most expansive, today's 1999 VW Polo SDI Variant is an example of Europe at its most constrained. It's so great a contrast that the Polo isn't even legally sold here, and the dealer offering this illegal alien claims it to be the sole example in the U.S.. The third generation Polo is supposedly based on the platform of the MKIII Golf, so much so that some parts are interchangeable. But it's SEAT (that's Say-aught, philistines) that is the source for most of the car, the Polo sharing much with the Spanish VW subsidiary's Ibiza. The variant, as exemplified here, is in reality a thinly disguised SEAT Cordoba, but don't bother looking for fine Corinthian leather, you won't find any. Instead, pop the hood and check out the 1.9-litre 47-kW (Europe, remember) diesel four is naturally aspirated and hence is branded not by the familiar three letters of the turbo diesel, but SDI which sounds like something you're afraid you'll catch while in Amsterdam. Manual transmissions are as popular in Europe as automatics are here, and this Polo comes with a 5-speed row your own. The combination of diesel engine, manual gearbox, and light (990 kg) weight work together to make this one efficient ride, providing what the dealer claims is 60 mpg highway. With fuel prices in the U.S. inching higher daily, that kind of mileage has appeal, but how about the rest of this Polo? The seller says this Polo has a winter package, and while I don't know what that means, I do know what happens to my package in the winter, and let me tell you, it's not pretty. Also somewhat on the short side is the number of miles this 13-year-old Vee-dub has traveled, coming in at a claimed 32K. Perhaps when it saw only one set of tire tracks, god was carrying it? The interior will come as no surprise to anyone familiar with nineties-era Volkswagens, although the dash is actually taken from the SEAT parts bin. Deutching it up a bit is a Blaupunkt radio/cassette player that probably only plays Kraftwerk and Nena. Everything else looks to be in good shape, including the seats with their technicolor yawn upholstery pattern. The back ones can be folded down of course, this being a wagon, although the under-hatch area comes with a surprising well and not a flat to the lip load floor. Outside you'll see why as the stubby back end raises the bumper and likewise the hatch lift-over point. The rest of the bodywork is pretty much all Cordoba, all the time, excepting perhaps the VW badges on the nose, tail, and plastic wheel covers. Still, it all looks pretty fresh, and when was the last time you saw a SEAT in the U.S.? Amazingly for a car that not only was never sold here, but also remains of such tender years to be considered of interest by both EPA and DOT, this Polo is being offered by a dealership. Now granted, the fact that they spell MOTORZ with a Z means they may not be the most legit of outfits, but they still make the claim that this Polo comes with a title clean enough to eat off. And after all, they're the ones that will have to deal with the title transfer and DMV bureaucracy. 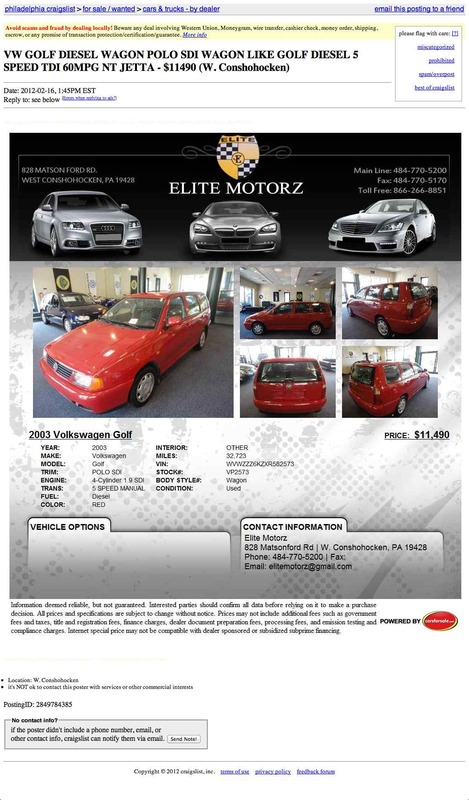 That being the case, let's say - for the sake of argument - that you could walk into ELITE MOTORZ of West Conshohocken PA, plunk down your cash, and drive out with this 60 mpg wonder, easy peasey. To do so however will require $11,490, and you better run because the seller says the car won't last. Perhaps the Feds are the reason for that. 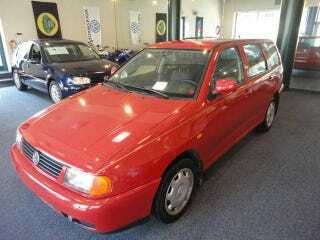 What do you think, is that nearly twelve grand asking price a good deal for this lone Polo? Or, does that price make staying away from this VW a case of polo contendere? H/T to dogisbadob for the hookup!